Moxtube brings you the latest design in Video Website trends with beautiful full you will have a ground breaking fully functional video website within minutes of purchase. Moxtube is most powerful and biggest Responsive Video WordPress theme develops specifically for video website. 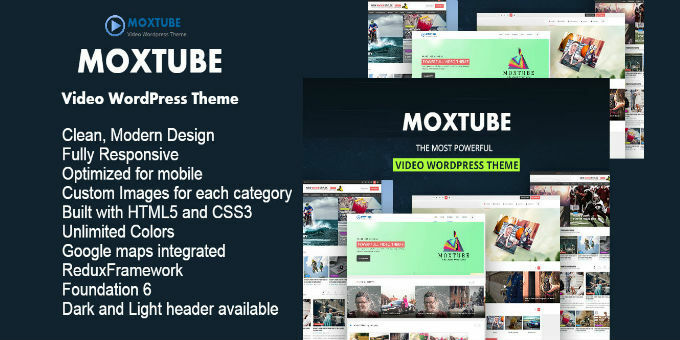 Moxtube is a WordPress Theme that helps you to do that! Stream your own media. Moxtube has nice user interface with great UX, with multiple homepage version.Its a modern, responsive, fully customizable video player for WordPress that support advertising and platforms like YouTube (single, channel, playlist), Vimeo, self-hosting videos (only mp4 required) and Google driver videos. With 10+ unique Homepage designs. Retina ready ? View great on high-resolution screen.